Nacho Cheese for your next Fiesta! Nacho Cheese! are you having a party? 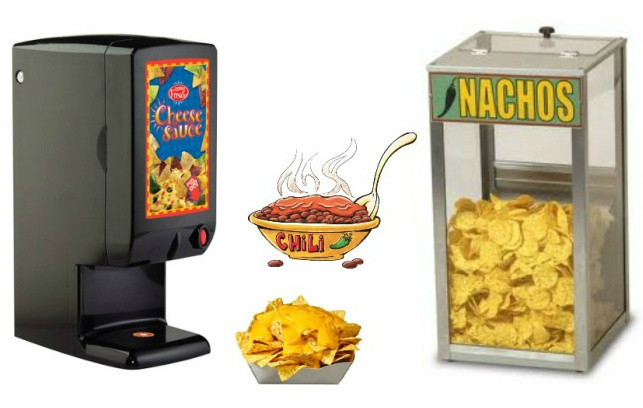 then dont be stuck cooking rent a Nacho Cheese Dispenser/Warmer and enjoy the Fiesta! the nacho Cheese warmer Comes with 140oz bag of Nacho Cheese and you can purchase an additional Cheese bag for only $19.00 + Tax. Additional Nacho Cheese bag can be kept in the dispenser tray directly above the Nacho Cheese bag being used, it will be ready to dispense once the first bag is empty. Overall Dimensions: Width: 10" Depth: 16" Height: 28"
Phoenix, Glendale, Peoria, Young Town, Avondale, Tolleson, Anthem, Laveen, Cave Creek, Scottsdale, Gilbert , Tempe, Good Year, Chandler, Surprise, Anthem, El Mirage, Waddell, Paradise Valley, Sun City, Young Town, Glibert, Mesa, Verrado, Vistancia. This is a Nachos warmer and keeps your nacho chip warm during the course of your entire event.